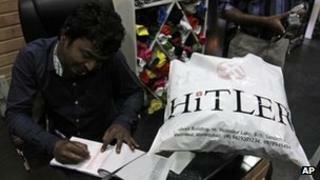 The owners of a new Indian clothing store called Hitler say they will rename it after receiving complaints. Rajesh Shah, one of the shop's co-owners, told the BBC there would be a new name "tomorrow or the day after". Jews in the city of Ahmedabad, where the shop opened last month, said using the Nazi dictator's name was offensive. Israeli diplomats also raised the issue with the Gujarat state government. The owners said they did not know who Adolf Hitler was when the shop opened. Mr Shah told the BBC: "Yes we are planning to change the name. There has been too much political pressure from the government." He said officials had promised compensation for the rebranding of the store, which sells men's clothing, although he said they had provided nothing in writing. His co-owner, Manish Chandani, told AFP news agency they had never intended to glorify Hitler. "I was not aware of Hitler being responsible for the killings of six million people before the shop's inauguration. This time I will choose a non-controversial name." Mr Chandani says the shop's name was a tribute to his grandfather who was nicknamed Hitler because he was "very strict". Others saw the name as a marketing gimmick in a country where the former German leader attracts unusual interest in some sections of society. "I am happy that the store owner decided to change the name. I guess he realised that it was not the right thing to do," Orna Sagiv, Israeli consul general in Mumbai, told AFP.